Hiding electrics/battery - Show off your set up! I know this has been covered in various threads, but it's sorta hard to find using the search function. I'm building a stripped down racer with minimal electrics. 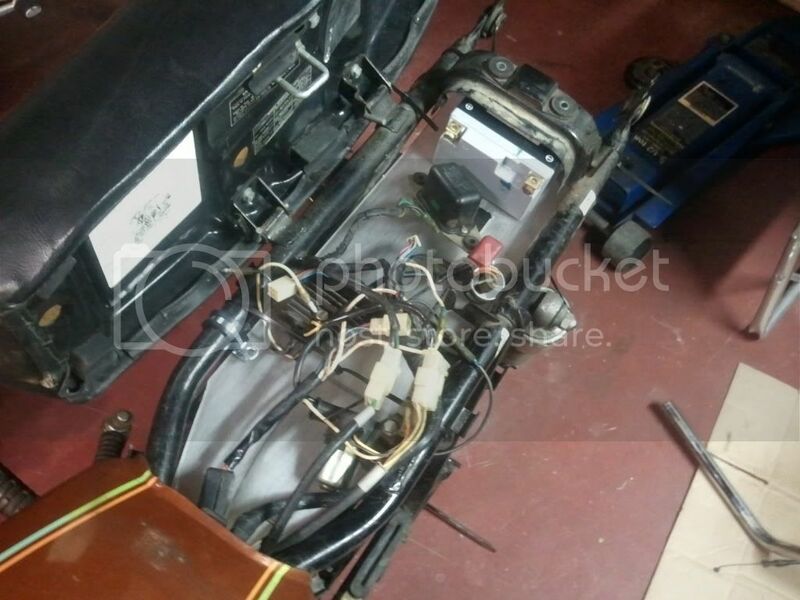 There will be a battery, voltage regulator, fuse(es) and starter solenoid. Not blinker or other stuff. The bike is small and space is limited. I could use the battery box area and fab up some side covers, but it would be great if I could hide as much of this stuff as possible and leave the "triangle" under the seat open. Show me your pics and a quick "How I did it" on your bike. Did everything fit under the seat hump? Did you hide the electrics somewhere else? I'm open to a small gel battery that I can lay flat or at an angle. Re: Hiding electrics/battery - Show off your set up! It depends on what bike and what seat. Normal way is to stick battery and everything else under the seat hump. Another neat trick is to make a amall tray just below the top rails and mount things like fuses, connectors rectifier etc on top of that tray below the seat. They should be 1-3" of depth to work with. The neatest wiring tirck I have see so far was on an H2R replica where the battery was moved to teh seat hump but there were wires than needed to get down to the motor. The builder made up a flat aluminum, rear fender mounted just in line with the front of the rear tubes. And he mounted another one towards the rear edge of the same tubes. that gave him around 3/4" of space to hide all those wires and connectors. If you didn't know, you would never pick it. really clean build. What happened to the other reply? Someone had pics of their BMW and now it's gone. I relocated all electrical under the seat of my kz400, really simple to do. Measured the space under the seat, used a piece of Lexan as the pan, moved the battery under the frame hoop and mounted the starter relay, rectifier, fuse box and voltage regulator to the Lexan. Using 1" electrical rubber mounts from Home Depot I attach the pan to the frame. Heres a pic I need to make it look cleaner just a starting point. Thats exactly what I am looking at doing to my bike. Where did you find the Lexan? Home Depot or Lowes, You need a scoring knife to cut it. Lexan and know was about 20. Im using 1" electrical straps to mount to the frame.